As a Francophile, harpist and lover of classical music, it was an amazing opportunity to be asked to write a new brochure for the Paris Opera House. 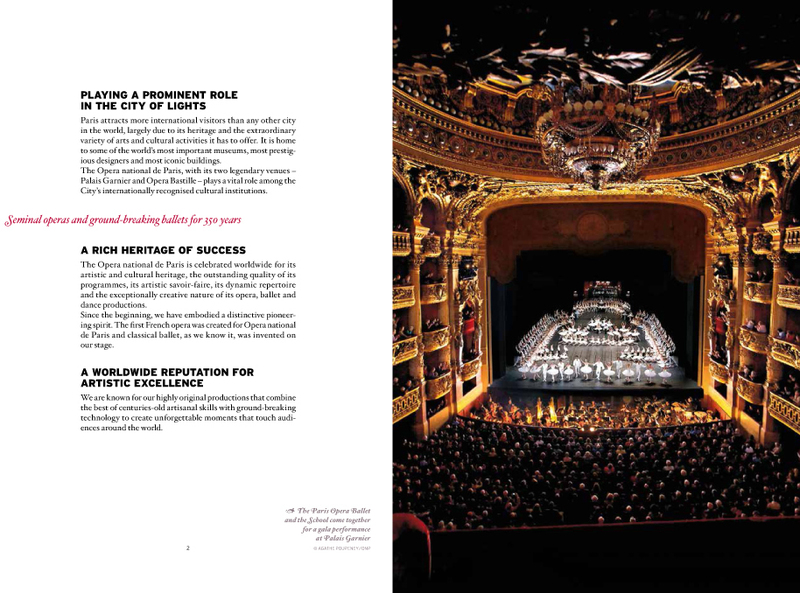 The brief was to write a brochure to introduce the skills and experience of the Paris Opera House to cultural organisations overseas. So if, for example, a city in India, China or Brazil was thinking of setting up an opera house, this brochure would showcase the expertise of Paris Opera House professionals who could help. The Paris Opera House wanted an English mother tongue speaker to write the brochure so that the language would appeal to the intended international audience. I learned so much during this project. The original opera and dance schools were founded by Louis X1V, and since that time, anyone who is anyone in the world of opera and ballet has performed on the Paris Opera House stage. From Gluck, Lully and Rameau to Nureyev, Callas and Pavarotti. The young dancers at the ballet school are called ‘petits rats’ – ‘little rats’, allegedly because the sound of their ballet shoes on point used to displace the creatures during rehearsals. This was many years ago, of course, long before the dancers moved to the new Ballet School in Nanterre. I also discovered that Opera House has its own in-house set design and technical teams, as well as a backstage family of 100 artisans, including painters, decorators, sculptors, shoemakers, milliners and wigmakers. Next time you’re in Paris, why not catch a performance at the Paris Opera House? There are also often exhibitions that delve into their costume collections, and regular tours around the Palais Garnier building.